Do Hedge Funds Love EZCORP Inc (NASDAQ:EZPW)? During the first half of the fourth quarter the Russell 2000 ETF (IWM) lagged the larger S&P 500 ETF (SPY) by about 4 percentage points as investors worried over the possible ramifications of rising interest rates. The hedge funds and institutional investors we track typically invest more in smaller-cap stocks than an average investor (i.e. only 298 S&P 500 constituents were among the 500 most popular stocks among hedge funds), and we have seen data that shows those funds paring back their overall exposure. Those funds cutting positions in small-caps is one reason why volatility has increased. In the following paragraphs, we take a closer look at what hedge funds and prominent investors think of EZCORP Inc (NASDAQ:EZPW) and see how the stock is affected by the recent hedge fund activity. EZCORP Inc (NASDAQ:EZPW) investors should pay attention to a decrease in support from the world’s most elite money managers recently. At the end of the third quarter, there were 19 hedge fund from Insider Monkey database long the stock, which represents a decrease of 2 from the previous quarter. Not only that the stock is slowly losing interest from smart money managers, but the number of investors it had at the end of third quarter was far from enough for it to be counted as one of the 30 most popular stocks among hedge funds in Q3 of 2018. Even though data reported by now represents a solid insight into the company’s popularity we don’t wont to make our conclusion here, and would like to seek more information about it. In the financial world there are a lot of gauges shareholders use to appraise stocks. A couple of the most underrated gauges are hedge fund and insider trading moves. Our researchers have shown that, historically, those who follow the top picks of the elite fund managers can outperform the broader indices by a significant margin (see the details here). We’re going to take a peek at the key hedge fund action surrounding EZCORP Inc (NASDAQ:EZPW). What does the smart money think about EZCORP Inc (NASDAQ:EZPW)? Heading into the fourth quarter of 2018, a total of 19 of the hedge funds tracked by Insider Monkey held long positions in this stock, a drop of 10% from the second quarter of 2018. 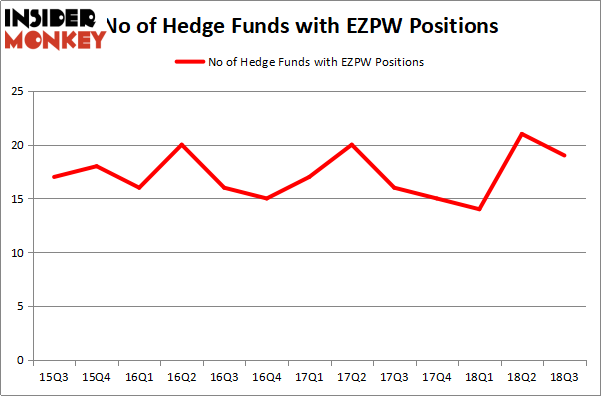 By comparison, 15 hedge funds held shares or bullish call options in EZPW heading into this year. With the smart money’s capital changing hands, there exists a select group of noteworthy hedge fund managers who were boosting their holdings meaningfully (or already accumulated large positions). Among these funds, Lafitte Capital Management held the most valuable stake in EZCORP Inc (NASDAQ:EZPW), which was worth $57.8 million at the end of the third quarter. On the second spot was Cardinal Capital which amassed $43.4 million worth of shares. Moreover, Renaissance Technologies, Huber Capital Management, and Archon Capital Management were also bullish on EZCORP Inc (NASDAQ:EZPW), allocating a large percentage of their portfolios to this stock. 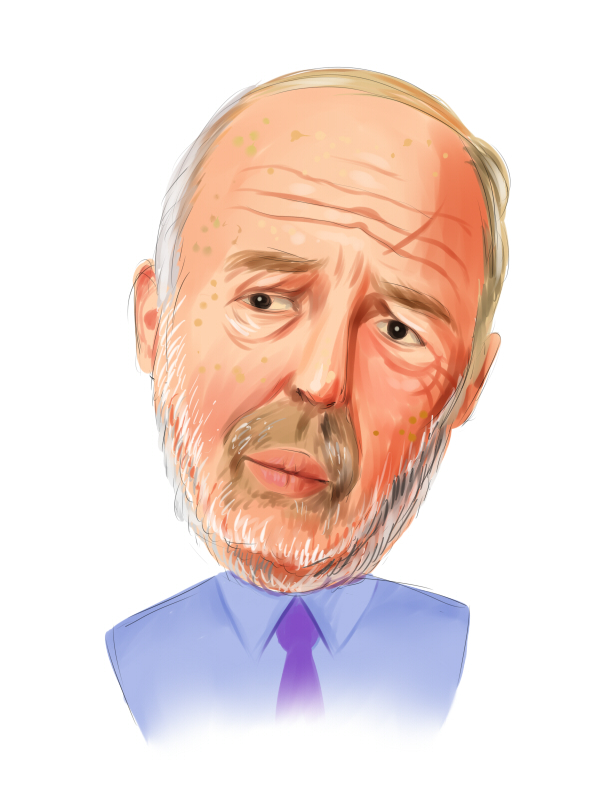 Seeing as EZCORP Inc (NASDAQ:EZPW) has witnessed bearish sentiment from hedge fund managers, it’s easy to see that there was a specific group of hedgies who sold off their entire stakes last quarter. Intriguingly, Noam Gottesman’s GLG Partners sold off the largest stake of the “upper crust” of funds tracked by Insider Monkey, worth close to $2.5 million in stock. Peter Muller’s fund, PDT Partners, also dropped its stock, about $1 million worth. These bearish behaviors are intriguing to say the least, as aggregate hedge fund interest dropped by 2 funds last quarter. Let’s go over hedge fund activity in other stocks similar to EZCORP Inc (NASDAQ:EZPW). We will take a look at Eaton Vance Floating Rate Income Trust (NYSE:EFT), , Genco Shipping & Trading Limited (NYSE:GNK), and Foresight Energy LP (NYSE:FELP). This group of stocks’ market values are closest to EZPW’s market value. As you can see these stocks had an average of 7 hedge funds with bullish positions and the average amount invested in these stocks was $93 million. That figure was $166 million in EZPW’s case. Genco Shipping & Trading Limited (NYSE:GNK) is the most popular stock in this table. On the other hand 0 is the least popular one with only 1 bullish hedge fund positions. EZCORP Inc (NASDAQ:EZPW) is not the most popular stock in this group but hedge fund interest is still above average. This is a slightly positive signal but we’d rather spend our time researching stocks that hedge funds are piling on. In this regard GNK might be a better candidate to consider a long position.